Where to go for vital information on this application for spectacle lenses has long been the question. ECPs estimate that as much as 10 per cent of the lenses they dispense are used by wearers for a sports-related activity, most commonly hunting and fishing, although a growing number of patients participate in so-called “action” sports, including snowboarding, biking and racing (both running and auto/motorbike). Despite this, education programs are often lacking in curriculum devoted to sports lenses. If you’re wondering what lenses and/or lens treatments will work for the sports enthusiasts in your client base, there are places to go before getting lost on Google. The proliferation of sports specialty magazines in response to the increased consumer interest in outdoor activities can help opticians and optometrists as well. According to Kay, many of these magazines publish feature articles that describe the “visual environments” specific sports participants experience; some include advice columns on eyewear needs. Many of these publications are online now, with searchable article archives. Sport-specific online chat rooms and web sites are also excellent resources. Erin Clarke, an optician at Aurora Eye Care in Grande Prairie, AB and an active outdoor sports enthusiast, says local sporting goods retailers have been an excellent source of information on different sports for Aurora’s optical staff. “They can explain some of the visual conditions and challenges with different sports because they deal with them all the time,” she says. Vendors who manufacture sport-specific products often provide plano sunwear or other eyewear for their respective customer bases. Kay says Cristall has partnered with a company that specializes in gear for motorcyclists to market prescription sunwear designed for optimal vision on the road. 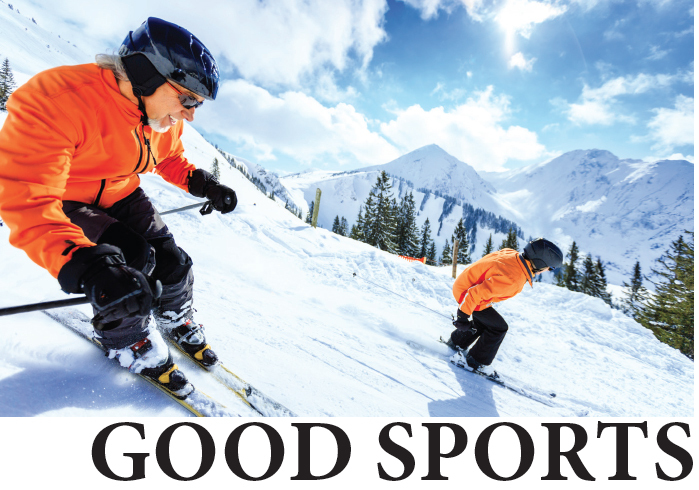 Clarke adds that she and her team at Aurora have researched the best prescription lens inserts for ski goggles and other sports specialty eyewear products to ensure the dispensary and its supplier partners offer them. It may seem clichéd, but a thorough patient/client history makes identifying the right lens products easier. According to Kay, “asking the right questions and communicating with your clients allows them to tell you in their own words what they need.” While she emphasizes that they won’t necessarily tell you what lens tint will help them see better in the woods while hunting, they may describe visual problems they’ve had. When your optical shop sells sunwear to 100 per cent of its clients, you’re bound to see more than a few requests for prescription wrap sunlenses. And that’s the challenge Gina Kay, optician and co-manager of the Toronto location of Cristall Opticians, faces daily. As many as 10 per cent of the lenses dispensed at her store are prescription wraps, and she has seen a significant increase in demand for the product over the past couple of years, particularly among presbyopes who prefer progressive lenses. Historically, eyecare professionals (ECPs) seeking prescription wrap sunlenses for their clients had to rely on sunglass manufacturers for supply. Unfortunately, many of these lenses were characterized by spotty optical performance, particularly in the periphery – or, as optician Paul Boyko, Jr. says, “from the curve out”. 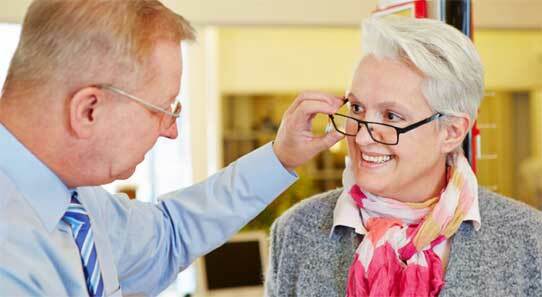 These problems were even more common in progressive lenses or bifocals. “We always had issues with wrap lenses and distortion was the biggest problem,” explains Boyko, owner of Windsor-based Visions of Canada. Now, several spectacle lens and sunglass manufacturers are offering enhanced prescription wrap technology, and the biggest improvements are being made in progressive lens designs. Boyko is taking advantage of what he calls “the evolution” of prescription wrap lens design to develop his own line of golfing eyewear called Visions for Golfing. Kay says Cristall uses wrap lenses from a handful of manufacturers but the shop also has an exclusive distributorship arrangement with a high-performance prescription sports sunwear line. Boyko says his high-performance edger is key to his success dispensing new prescription wrap lenses; if you finish in-house—or use an outside lab—make sure the edger being used to cut your wrap lenses is equipped to do so. Even with improvements to wrap technology, clients should expect to pay more, especially in progressive designs. Eyewear with prescription progressive wrap lenses can fetch as much as $1,000 at retail—great for ECPs seeking to maximize profits but, perhaps, difficult to swallow for some clients. Make sure you explain the technology and the enhanced vision it promises and remind clients that they will be wearing a high-performance product. Kay and Boyko both note that, as with all spectacle lenses, some wrap designs are better than others. While there is some parity in single-vision, the differences in quality are very apparent in progressives. Before pushing wraps, make sure you are using designs patients will be happy with. 1. Think progressive, even with long-time standard bifocal wearers. In the past, standard bifocal wearers switching to progressives have often ended up being non-adapts; the two lens types are just too different. However, today’s free-form technology has reduced problematic peripheral distortion in progressive lenses and enabled the creation of prescription lenses that match exactly with wearers’ visual needs – as a result, fewer non-adapts. “Nothing drives me more crazy than hearing someone say they can’t switch older bifocal wearers to progressives,” says Gisele Klein, optician and owner of Impressive Eyewear in Surrey, B.C. “It’s just not true.” If you can convince older patients that the visual benefits of free-form progressives are worth the extra cost – not always an easy thing to do – you’ve done the heavy lifting, she adds. 2. Talk treatments. As seniors are often plagued with ocular health issues such as cataracts, dry eye and/or allergies, glare protection is important in this patient population. Gray and/or pink tint treatments for spectacle lenses were once popular among elderly patients for this reason. Now, however, seniors are more interested in photochromic lenses, both for their convenience and glare-reducing capabilities outdoors. Anti-reflective coating is obviously a must for older eyeglass wearers, to soften glare and halos, particularly at night. 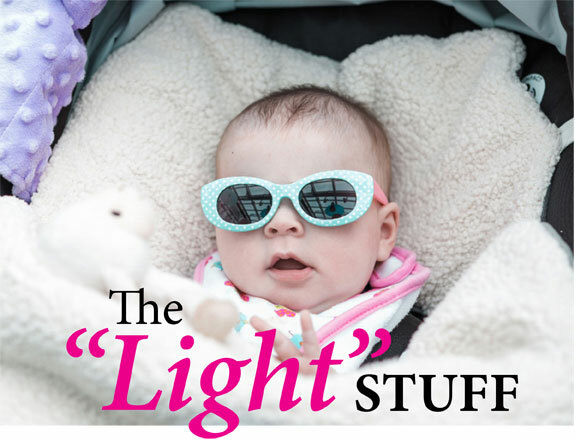 In addition, ultraviolet coatings eliminate the danger of damaging sun exposure to the eyes, which has been linked to the growth of cataracts and the incidence of eye diseases such as macular degeneration and glaucoma. 3. Take it light. Older patients can be bothered by heavier specs, either because they tend to slide down their noses more or irritate their thin, sensitive skin. High-index plastic and polycarbonate lenses address these issues, and improve wearers’ overall look as well. 4. Explain yourself. When fitting older patients, it’s important to be polite and respectful without being condescending. Not all senior patients are going to understand free-form and other state-of-the-art lens technologies. However, given that you will need to take several measurements in order to fit the newer lenses – a process that may be taxing for some older patients – it is important to explain what you are doing and why. Keep them engaged. 5. Measure up – or, in some cases, down. Many older people slouch when seated, or are hunched over due to arthritis or other physical ailments; still others are wheelchair-bound or use walkers. All of these scenarios make fitting at a conventional dispensing table difficult. Opticians should not ask or expect these patients to conform to the dispensing table; rather, they should seek to fit according to how their elderly patients sit and/or position their heads (and eyes) when reading, watching TV or engaging in other activities (such as playing card or board games). Fitting elderly patients with premium spectacle lenses may take a little extra time and effort, but in the end you’ll reap the benefits of happier patients – and healthier sales. Let’s face it: Selling frames is easy – at least when you compare it to pitching lenses. 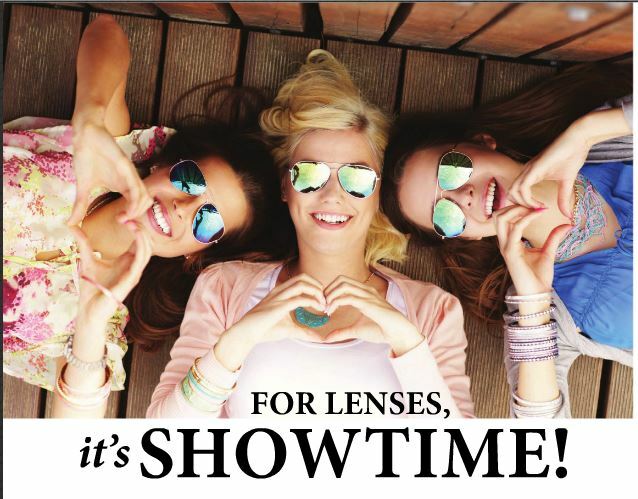 Frames are the first things patients see when they walk into most optical stores. They can shop the frame boards, pick out styles they like and check a nearby mirror to see how they look. Computerized frame-on-face programs have made the process even easier. Sure, opticians have to deal with stubborn or overly price-conscious patients now and again, but the benefits of frames are tangible and, thus, easy to demonstrate. Not so lenses. Yes, lens manufacturers and optical laboratories have done their best to develop point-of-purchase (POP) materials that highlight the unique selling points of their products, but it’s difficult to demonstrate exactly how patients will see out of their new lenses before they have been processed according to their individual prescriptions. Watson cautions against having too many lens-related displays in the store, as they can ultimately confuse patients. Study your patient base. Does your optical/practice have a pediatric focus? Then make sure you have POP for polycarbonate. Have a lot of young, fashion-conscious patients? Then high-index and free-form sales aides are a must. 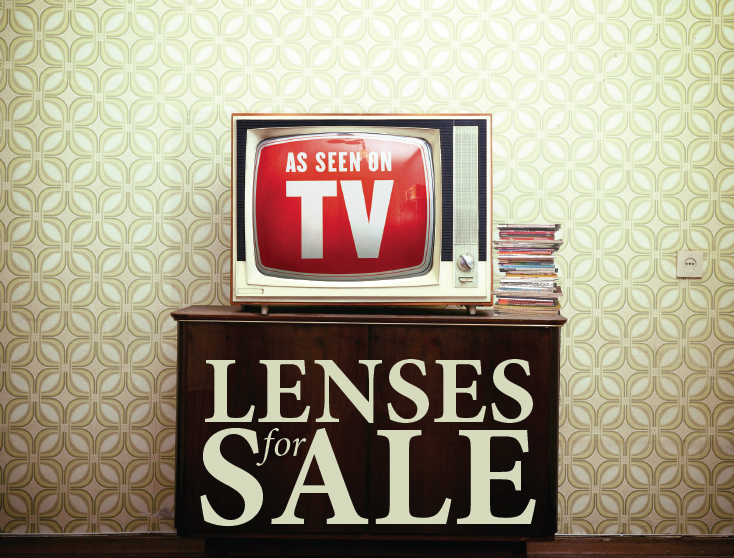 More and more lens manufacturers and labs are creating POP for their customers. Find out what’s available. Watson also recommends visiting optical stores in other markets – he likes to do this while on vacation – to see how they display lens technology. There may be an app for that. What patients ask about lenses can be a guide to what lens POP you need in your store. If a lot of patients come in asking about how photochromics work, for example, it might be time to ask vendors about any available displays – or create your own. If you like it, frame it. Lens POP you create yourself doesn’t have to be that elaborate: a nice, trendy frame with an uncoated regular plastic on one side and an anti-reflective coated high-index lens on the other can be very effective. “It’s a simple way to let customers see the difference in thickness, weight and cosmetics,” Watson says. Whether you use premade POP or create your own, it is imperative that the materials fit the design and tone of your store – and match the priorities of your patient base. Even the best lens sales aides won’t be as effective as frame boards, but they can make dispensing spectacles easier. Gisele Klein, optician and owner of Impressive Eyewear in Surrey, B.C., remembers when a male patient came into her shop with a specific frame brand and lens budget in mind – and that he almost walked out when she advised him to change. Klein, who has been an optician for almost 30 years, has noticed a marked change in the way men shop for eyewear products – both frames and spectacle lenses—in recent years. 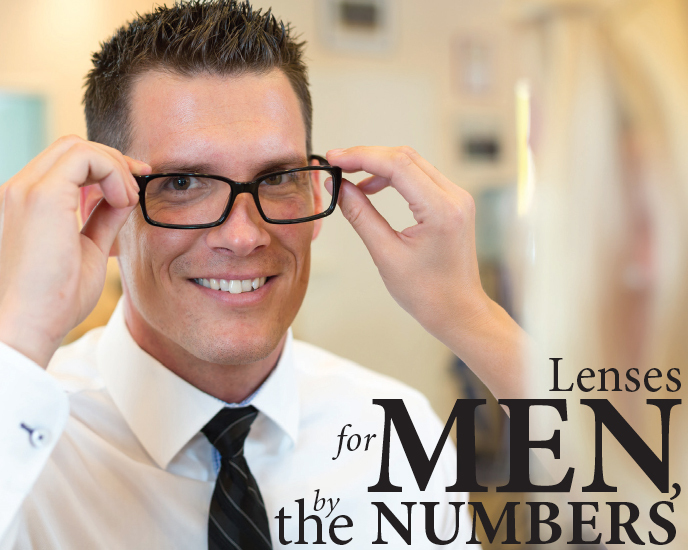 Historically, for example, male patients have tended to be more price-conscious than women when it comes to spectacle lens purchases. Now, though, opticians such as Klein have found men who come into their shops or optical departments to be more willing to explore new frame and lens options. Before asking about price, she says, men are asking about specific lens designs for their work and leisure-time activities. “If they know they have choices, men are much more willing now to get out of their comfort zone,” Klein explains. 1. Be prepared, but don’t pre-judge. Madelaine Petrin, R.O., B.Sc., professor of opticianry at Seneca College in Toronto, discusses gender differences with her students, but she also advises them to be sure to listen to individual clients. “It is smart to listen to what matters to the client,” she notes. That said, even though she acknowledges that assessing clients based on gender is “stereotypical and simplistic,” it can often be the quickest way to read them. “Sales are done in a short time and it pays to understand what the client thinks is relevant,” Petrin explains. 3. Be timely with your tech talk.